Serbian Orthodox Diocese of Eastern America - "Тамо далеко: 1918-2018" / "Over There, So Far Away: 1918-2018"
"Over There, So Far Away: 1918-2018"
A visual-literary exhibit "Тамо далеко: 1918-2018" / "Over There, So Far Away: 1918-2018” celebrating the centennial of the victory of Serbia in WWI will be on display during the academic symposium. Created by Mr. Marinko Lugonja and Mr. Marko Kentera, this exhibit is presented by the Office of Religious Education of the Serbian Orthodox Church Eastern Diocese in cooperation with nonprofit organization Art Exchange. “The theme of the exhibit is not necessarily the phenomenon of war. The theme is the Human Being, the Warrior, the Serb that fought the Great War and endured. The selected testimony, facts of interest, anecdotes, speeches, poems, quotes and photographs, have been arranged in an almanac titled Little Newspaper and enriched with a collage of authentic scenes from the Great War. To the average viewer, the exhibit will evoke the spirit of those bygone times and most viewers will for the first time become acquainted with facts that are in many respects unique and unusual. The text presented is sourced from works such as ‘The Thorny Path of Serbia 1914-1918’ by the Association of the Bearers of the Medal awarded to commemorate the retreat of the Serbian Army through Albania, ‘The Thessaloniki Front Warriors Speak’ by Antonije Djurić, and ‘The War Album’ by Andre Popović, which represent the classic literature on the topic and the source of authentic testimony on this glorious and epic era. 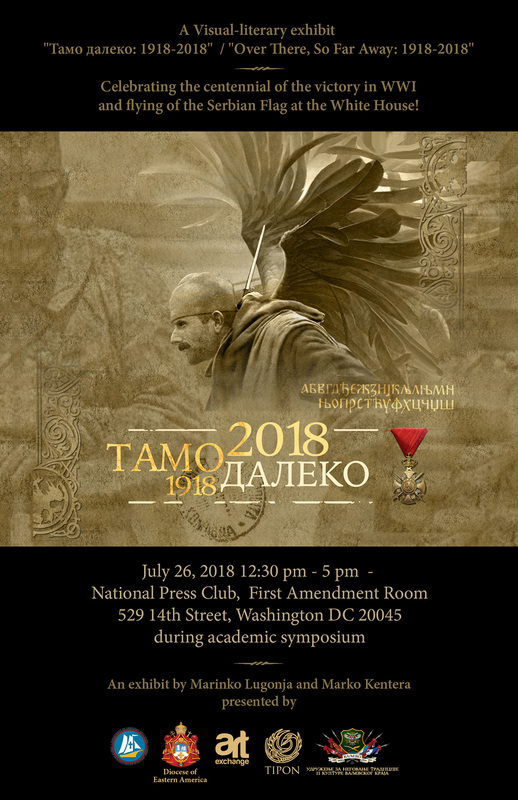 The aim of the exhibit is to introduce the Serbian people and a wider international audience to the destiny of glorious Serbian ancestors and to preserve, in recognition of their sacrifice, the memory of the events that transpired and that are presented by the exhibit. The textual portions of the exhibit are in the Serbian language and the viewers are able to access the English translation by scanning a QR code with their mobile devices. The exhibit is accompanied by a catalogue, a printed sample of the annual almanac and an Internet presentation.